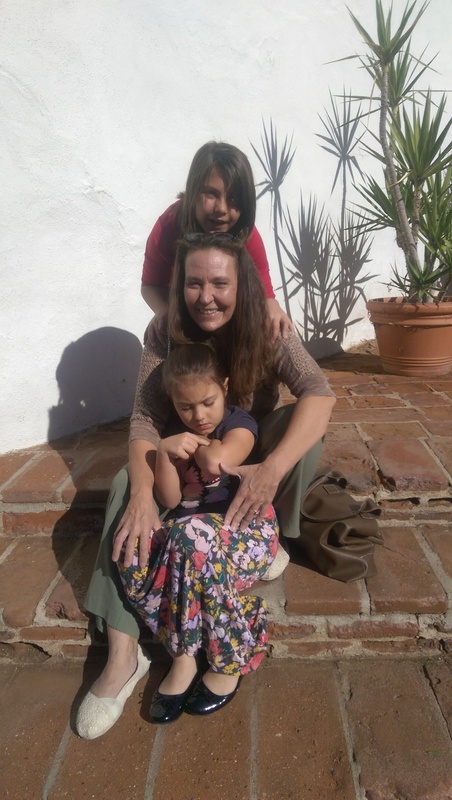 On this past Sunday, my family and I were blessed to attend Holy Mass at Mission Basilica San Diego de Alcala, which has been deemed as a Holy Door pilgrimage site. I had found this out about a week ago, while attending Holy Mass on my birthday, which turned out to be a Holy Mass celebrated for the Immaculate Conception. My health problems have been flaring up, even in recent days, so for me to actually make it, with my entire family, on the day the Holy Door was blessed and opened, along with attending Holy Mass after, I consider a HUGE gift of our Lord. I cried. For many years, close to twenty, of asking, seeking, wondering, repenting, lamenting, praying and crying, became rejoicing. Its not to say that simply by me walking through that door means my conversion of heart is over, but it reached a point in letting go. Letting go of the past and accepting the mercy and justice of our Lord. It reached a “growing” point that only our Lord can measure. Saturday night before hand, I found myself looking at different religious art on the internet. This is something I love to do. My husband and I don’t have much money, so being able to see the beautiful paintings and other items on the internet gives me an outlet, to spend time with our Lord in a way that is very personal. We scroll through different sites and He leads me through different countries and far away museums showing me all the wonderful artwork that I would never be able to see in any other way. 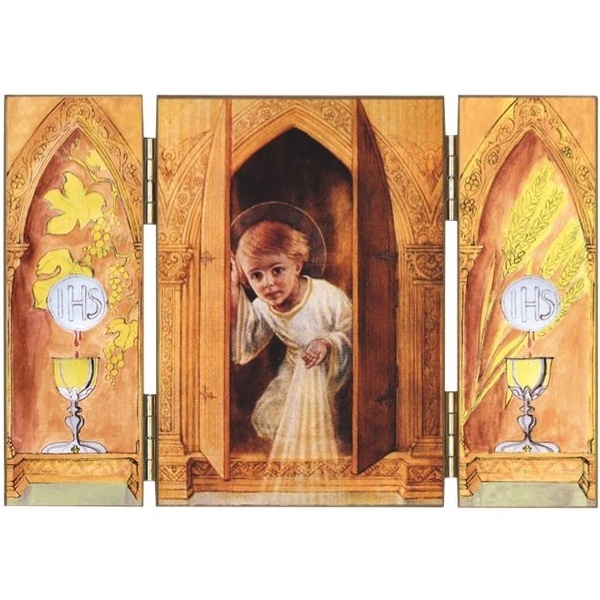 We found this painting below, of our Lord as the Holy Child in the Tabernacle. Going back to Sunday’s Holy Mass, along with walking through the Holy Door. Fr. Peter came out and the doors were shut. Holy Mass began outside, he blessed the doors, the hammer hit them and they were opened so Mass could continue. The crowd processed inside through them and Holy Mass continued. As Father began his Homily, it was all about “The Waiting”. He mentioned a list of things we wait for, and as he did, I whispered to my husband, I had been waiting for this day for close to twenty years. I would love to say that every Holy Mass I have ever attended is etched in the forefront of my memory, but all have not. There are many! But, not all of them can hold a position like this one has. When father continued his “Waiting” homily, I listened intently putting in perspective of the past 2015 years since our Lord rose from the dead. In the last, minuscule in comparison, 49 years of my life. then again in the “waiting” to receive our Lord in the Eucharist while out of communion. Waiting for doctors test results. Waiting to have tests done. Coming around then, to the mercy of our Lord, for giving me the time to wait. As Holy Mass concluded, I found myself in His peace. There was a moment when I realized I had a busy week ahead with Doctor appointments and forgot all about the pain I was having. I thought how beautiful it would be, to be able to receive Anointing of the Sick, since I had just received our Lord and walked through the Holy Doors. It had been a while since I had receive Anointing and being that my condition may need surgery, what a beautiful day to have this done. It wasn’t as if I NEEDED to get this done NOW. That “feeling” wasn’t present. I was not pushing for this. It was as if it was a suggustion to my soul that really became something I should do, but, only if it could be done, it would be good. As we were leaving the Church, I told my husband I was going to ask Father if I could receive Anointing. I waited for the crowd to pass me by, and when it became thin and father wasn’t bombarded with souls, with only a few souls left, I approached Father and asked him. He told me he had to be at the airport within thirty minutes to catch a flight and told me, VERY humbly and graciously, that I could call the office in the morning and one of the other priests would be able to do just that for me ASAP since my first appointment was on Tuesday. He told me he would DEFINITELY keep me in his prayers as he was about to rush off. I pray no one takes this as a NON act of Mercy as I can see, it truly was our Lord at work through him, telling me no. I was at peace with his answer, and thought how I would be able to just attend the next day, and ask my Parish Priest for the Sacrament. My family and I left and had a few moments at home, “waiting”, before my older daughter had to be at our home Parish for singing in Festival of Carols. As we arrived at our Parish, the Church was a bit dark as we walked in, I dipped my hand in the holy water font and genuflected turning to our Lord in the Tabernacle. To my surprise, the doors of the Tabernacle were wide open, and our Lord had been moved for this event. We took our seats in the pews, and “waited”. After a few moments, I noticed my Pastor mingle with others. I went to him and asked him, if he had time after, if he could give me the Sacrament of Anointing of the Sick. He graciously said yes that it wouldn’t be a problem. The caroling was beautiful and at times, everyone in attendance was asked to stand and sing along. Between carols, we reflected on scripture readings and Gospels, ending the afternoon with a beautiful sense and understanding of the magnitude and meaning of our Lords birth, and the time spent by many souls “waiting” for Him, before His birth. When all was over, my “waiting” for the Sacrament of Anointing of the Sick, was over as well. Father called me to the back of the Church. We were standing next to the Baptismal Font facing the Altar. I looked up the aisle to the Tabernacle of our Lord, behind the Altar which the doors were wide open. As Father began the prayers over me, that painting of the Holy Child Jesus in the Tabernacle, very vividly, came to mind. Some things, with His grace, you just know. Praise, honor and glory to our Lord, Jesus Christ, now and forever.